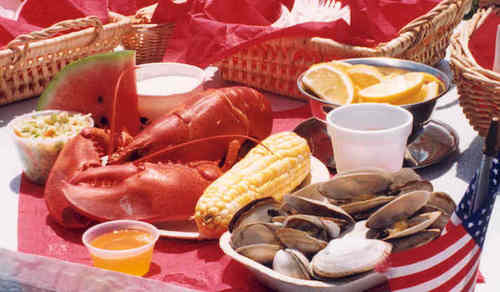 A backyard clambake is the pinnacle summer activity, made even more special when you’re surrounded by family and friends. However, as much fun as they are for guests, backyard clambakes are messy and sometimes a headache for the hosts. Don’t let the mess intimidate you; with careful planning, you can host a successful backyard clambake by following these four secrets. The best backyard clambakes are those where the atmosphere is kept light and fun. Encourage guests to dress down and prepare to get a little messy. To aid in the mess clean-up, use heavy-duty paper plates and cups. There are many colorful options for paper products, which can make the party feel less utilitarian and more festive. Grab some extra-large buckets and ice to store drinks, and don’t forget a big bowl on the table to gather the spent shells. String fairy lights around the backyard, create a summertime playlist, and encourage guests to participate in old-fashioned games to contribute the casual ambiance. If you’re cooking, prepare as many of your dishes as you can ahead of time so that you can focus on the actual clambake during the party. From chopping ingredients to assembling salads to baking desserts, prep work will ease your stress on party day. Another option is to cater the clambake, making it even easier. Catering will ensure the food is cooked perfectly, without any second-guessing if it’s done, and it allows the hosts to more thoroughly enjoy the company of their guests. We mentioned clambakes are messy, right? Stockpile moist towelettes and place them on every table set up in the backyard so guests can easily wipe themselves down after devouring their plate of food. Also, strategically place trash and recycling bins around the yard so guests know exactly where to put their empties. Another idea is to invest in some cloth napkins; since they’re heavier than paper, they can sop up a lot more of the mess. Another unique idea is to pass around warm and moist washcloths to guests once the meal is completely over. They’ll appreciate the chance for a more proper wash-up and no one will have to jockey for position in your bathroom. Beer goes hand-in-hand with the light-hearted clambake atmosphere. But you can get creative here, especially if a caterer is handling the cooking and you have extra time to focus on drinks. Choose crisp summer ales and citrusy white wines, both of which pair wonderfully with seafood. Also consider making a refreshing signature cocktail and placing it in a mason jar with a spigot for added flair. From margaritas to sangria, think creatively to give your guests something unique to drink. Although it may feel daunting, hosting a backyard clambake doesn’t have to be super stressful. By embracing a carefree attitude and spending some time on the planning and prep work, the event is sure to be the talk of the summer. Contact Woodman’s today for more information about clambake catering. How to Choose a Venue for Your Summer Event What Makes a Killer Backyard BBQ?